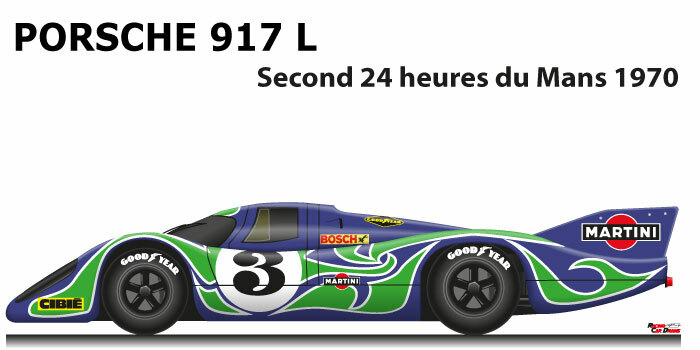 The Porsche 917 L n.3 is a prototype that came in second to the 24 Hours of Le Mans 1970. The Stuttgart manufacturer presented the new 917 in 1970 in various versions, the main one was the long-tails, designed to take advantage of the long straight of the Hunaudieres but with a lot of instability in the slow corners. At Le Mans they presented a car painted in purple with random green psychedelic signs with white edges. Gerard Larraousse and Willi Kauhsen with the Porsche 917 L n.3 came second at the 24 Hours of Le Mans 1970. Twelve tenths on the grid managed to climb in third position after seven hours. At the twentieth hour, they were second and held this position behind the Porsche 917 K n.23 drivers Richard Attwood and Hans Herrmann who won the race with five laps of advantage.